Recently, some peoples worlds have been turned upside down once again with a multitouch-enabled DJ rig built by Gregory Kaufman. 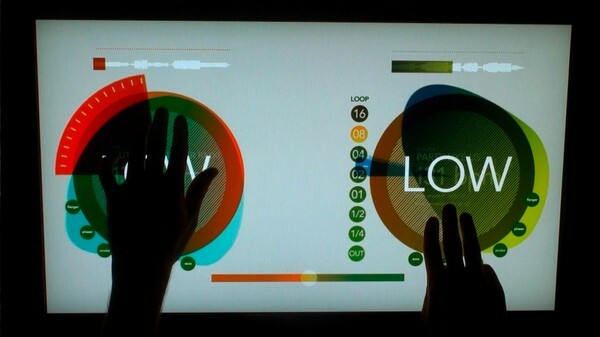 The set up employs a gesture-based interface that lets you spin the virtual turntables and use a variety of taps and finger swipes to replicate the main functions of a regular DJ deck. What’s more, Kaufman says that the only gear a DJ would have to carry is a USB drive with their own music and settings, which they’d simply plug into the multitouch table at a club — assuming the idea catches on universally, that is. To top things off, the system would also be able to accommodate regular DJ gear for some added flexibility, and even provide enough room for two DJs if you’re looking to battle or share the stage. I instantly see some functionality issues, and I can already hear the massive classic vinyl crowd crying about how it makes you less of a “true DJ” when you use it. But personally I think the concept is worth taking some time to consider, and I would totally be interested if someone put one of these in front of me to try out.